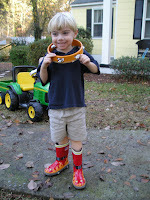 Apparently, there is a little confusion about the function of a tambourine. Sam started this whole thing on Thursday of last week. 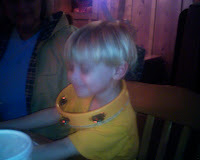 We went out to dinner and he insisted on "wearing" the tambourine around his neck. There are some battles that we just don't fight! Besides, we were only going to D's. 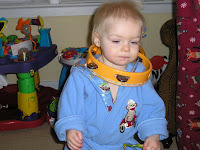 Well, he wore it all day Friday too and...Monkey see, Monkey do...Fulton decided to "wear" it on Saturday morning. Still there is no real explanation of why from Sam. But we thought it was hilarious. Shannon took the first picture with his phone and it was terrible quality but you get the idea. They crack me up!!!!!!!!! !